---------------------------------------------------- Esperanza Resort in Cabo San Lucas. Find out if it's the resort for you. The Esperanza Resort in Cabo San Lucas is a resort with Casitas and Villas as your home while your vacation. 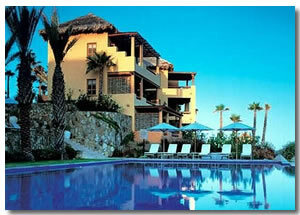 About 6 km from downtown Cabo this beach-front resort is high end luxury, and that is reflected in the price. This Cabo San Lucas hotel is situated along the Los Cabos Corridor so it's perfect for a quieter, more relaxed vacation. If you play golf you have the luxury of being very close to the Cabo Del Sol golf resort. The Ocean course was designed by Jack Nicklaus, and the views are amazing as you're working your way around the course. They can be a bit distracting to your game as well, just remember to take your camera as this is a beautiful part of Mexico. There's also a desert course that was designed by Tom Weiskopf. This Los cabos course is slightly easier to play than the ocean course due to the size of the landing areas. There are 4 restaurants for you to try at the Esperanza resort in Cabo San Lucas. This is a high end Los Cabos resort so as with everything else the food comes up a bit expensive. If you can afford it you won't be disappointed. The Restaurante - This is the Cabo Esperanza resort's main restaurant. It has a beautiful thatched roof, and wooden hand carved furniture. You are served seasonal dishes known as "cuisine of the sun". The Palapa Bar & Grille - A lovely little restaurant serving Mexican and American lunches and dinners. It's a much more casual place than The Restaurante, and makes a nice change from the more traditional dinners. El Mercado - You can get picnic baskets prepared for you here. Wines and groceries are also available. They're perfect for that romantic lunch on the Los Cabos beach. El Bar - This is also a more casual bar. Music and live entertainment is there for you every night. If you like your tequila there's a tequila menu. Sandwiches and burgers are served as well as small appetizers. The Esperanza Resort in Cabo San Lucas has more than enough varieties of food. You can eat there every day without leaving the resort if you can afford to. If you can tear yourself away from relaxing on your vacation you have plenty to keep you occupied. On the hotel side of the Cabo Esperanza resort you have two infinity pools to sunbath by, or splash around in. These pools have the extra luxury of not allowing children, so it's a more relaxed atmosphere. Pool service is excellent. Cold face towels are in regular supply as well as an ice bucket filled with bottled water. The residents side of the Esperanza resort in Cabo San Lucas has two pools as well, and these allow children. One of these has a swim up bar which is an added bonus sometimes. You can have room service first thing in the morning. Breakfast is served on your terrace. Toast is made fresh in front of you so it's hot. Get a room with an ocean view, this can really make a difference to your Cabo San Lucas vacation. Your room will be spacious, they average about 950 square feet. The Esperanza Resort in Cabo San Lucas gives you a complimentary chair massage in your room soon after you have arrived. It's timed just right after your traveling. This is really high end Cabo San Lucas if you have the money it's well worth it.